An album worth waiting for – 13 all original, intimate, yet highly polished Nu Jazz songs by a pioneering singer-songwriter. A landscape of soulful melody, bitter-sweet funk, dreamy harmony and dark, bluesey magic. 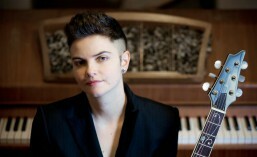 Talented guest musicians contribute a range of hues, with treacle-toned flugelhorn, strings, flutes, latin percussion, and the artist herself on displaying an enjoyable command of guitar, piano and keyboards. Not to mention a shimmering, hypnotic vocal register that demands your attention. A joyful creation, wrought in the company of good friends, old and new – this is a classic Faye Patton recording to add to your collection.